On the trail of another man, the biographer must put up with finding himself at every turn; any biography uneasily shelters an autobiography within it. For any journey other than the usual neighborhood streets and thoroughfares of daily life, we typically face a choice of the oft traveled highway for speediness’ sake or alternately kicking up a plume of dirt on the rolling, graveled backroads for a bit of adventure and a chance at whimsy. As you are well aware, for this trip into the Why and How of the 60 & 3 era I’ve chosen to turn off of the more beaten path a time or two, sometimes to interject an unknown figure, others to reintroduce you to individuals hidden or long forgotten, and still yet a few who I felt might hold a more colorful, revealing, or excessively insightful viewpoint to the collection of our acquired kNowledge. In this particular case I found myself taking a pit stop at a figurative roadside convenience store embodied in sportswriter Mike Babcock. Question: So, Mike, It sounds like you’re pretty busy at the moment with announcing Legion baseball there in Lincoln..
Mike Babcock: Yes, they have a hard time finding volunteers. So I guess the bottom line is I’m available rather than good. And it pays well: nothing. (laughs) My wife has to be pretty understanding when tournament time comes, because it’s pretty much every night. Q: It’s amazing: the more a guy is around sports, the more you find that everyone’s wife has to be pretty understanding, no matter what you do. MB: Yeah, and when I was at the newspaper, The Journal-Star, like any reporter who covers the beat (obviously, it’s a lot harder on the coaches with the recruiting and everything they do), but there are some similarities in a minor way with the travel demands and such. For example, when Nebraska was going to a bowl game for 35-some consecutive seasons, you’re gone during the holidays every year. You can just kind of figure on that. And the way we’d do it at the newspaper was we’d be there a week before the bowl, as well, so you’d often spend Christmas Eve and New Year’s Eve on the road. Q: Did you ever take your family along on those trips? MB: Oh yeah, Darren and Damon Schmadeke, those guys were both walk-ons from… I can’t remember the town off the top of my head, but yeah, I remember those two guys. MB: Yeah, that’s important. He has his own book coming out, Beyond the Final Score. It is kind of his views and experiences post-football. I heard him talking about it. 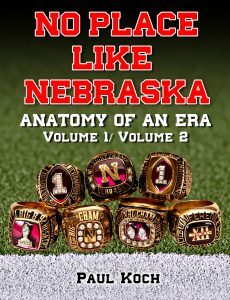 The way I heard about it was when the publisher called me and said Tom wanted to quote some things from the Heart of a Husker book and they needed permission to do that, so that’s when I first heard about the book. Q: Where did you grow up and what got you into sportswriting? MB: Well, I was born in Beatrice but I grew up in York, forty miles down the line. My first year of school I went to York College there in town because I could afford to do that. I wanted to go to the University but I could afford to go to York College because I got an academic scholarship. I’d hoped to play basketball and ended up playing a semester of basketball and played baseball in the spring. My second year I transferred to the University of Nebraska, and my folks moved to southern California in the summer of ’67, and as soon as they moved I was a non-resident in Nebraska and I just couldn’t afford the tuition, so I went to California with my folks. And after nine months out there you established residency, so I got my undergraduate from Chico State in English and then I came back to Nebraska and went to graduate school and got my Masters Degree in English and started out teaching at a community college in Illinois for seven years. And they gave me the Nebraska beat. This guy took off and opened up the job on the Husker beat, so I went from basically covering the high school beat half-time and working full-time as a teacher in the community college to working full-time on the Husker beat. I started on August 5th. And four weeks after, Nebraska opened the ’78 season against Alabama in Birmingham. Q: Thumbs up, thumbs down, huh? MB: (laughs) Yeah. I was a little unrealistic in my expectations, but that’s what I thought at the time, you know? I always felt I could do anything I wanted to do, but if ever possible I’d be a sportswriter and were I to live anywhere it would be in Nebraska. Q: So after spending some time out in California and then Illinois, Nebraska was still close to your heart? Q: So let me ask you: those early nineties years building up to the Florida State, Miami, & Florida national championship games, as a sportswriter what was your main aim? 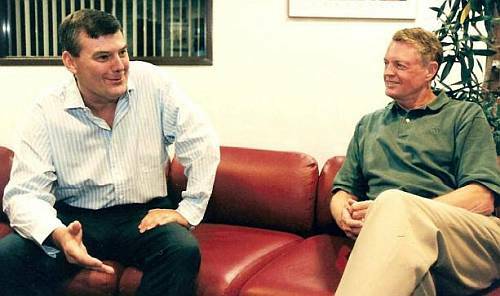 Was it to inform, to entertain, to set policy? How did you envision the main gist of your role as writer? 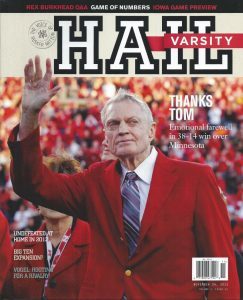 A couple things I learned early on -and I might have known this even before I got back to Nebraska- but during the early years when I got here, when I took the job in 1978, it was like most people would perceive that job as, “Oh my gosh, this guy has the opportunity to sit in the press box every game and watch this stuff. It’s just a great deal, everybody would want to do that.” But if they knew more they would change their mind about it. Because when the game is over with you have to sit there and put together an article and they’re out partying. But I can remember when Nebraska, I believe it was while I was a sophomore at the university -which would have been in ’67 or ’68, in the fall of ’67 when I was a sophomore- Nebraska put the N on the helmet for the first time. I can remember the first semester. (I lived in the second floor of my uncle’s house -he lived right across the train tracks there on Y Street). There wasn’t any room in the dorms so I lived with my aunt and uncle for probably the first half of the first semester and then moved into temporary housing in Abel Hall.) But I remember my uncle going into the locker in the field house there and taking all the helmets out and putting the strips on them and placing the N’s on the side. So I always had a little bit of an insight into it since my uncle was there. And it was a big deal to be around there. When they’d collect the shirts, ones the guys didn’t pick up or threw on the floor, he’d wash them and he always had a bin full of those things. And I had a Colorado Buffaloes t-shirt that somebody had left there. (laughs) But I had a tenuous connection there. 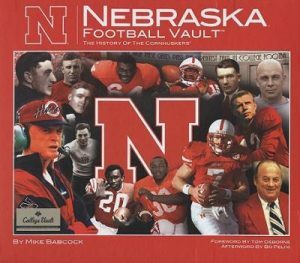 Q: So one could say that, in certain respects, that Mike Babcock was partly responsible for putting the infamous N on the Husker helmets? MB: My recollection was that we may have cleaned them or something, but I just remember taking them out of the lockers and putting some N’s on them. And you know, the N’s were initially a little bit smaller. There was a sequence there: first they were smaller, then they were bigger. So I think they played around with it for a while.